The city hosts a photo contest called "What Do You Love About Santaquin?" each year which provides our website with beautiful images from residents. The city also hosts a video contest for the high school students each year. 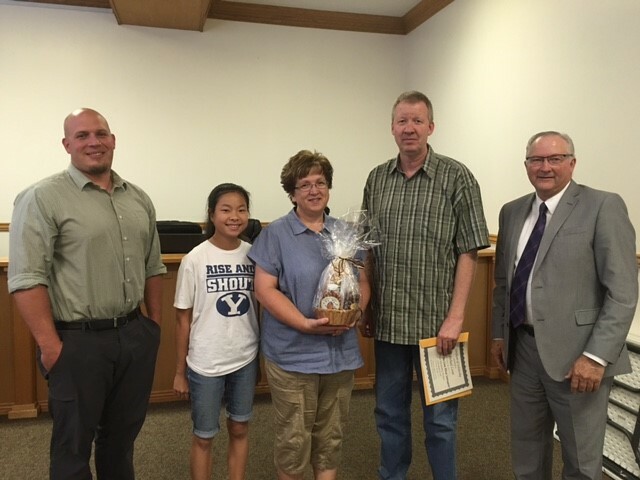 The city awards someone in the community worthy of being the Volunteer of the Month. We are proud to recognize our great volunteers. Click on the ribbons below for more details about the programs. To View our Winners and Awards, click on the gray menu to the right. Deadline to enter: By the last day of the month, each month of 2019. Winners announced the following month. Submit your photo, a description of the location in Santaquin, and the date picture was taken by email at photocontest@santaquin.org. Maximum of three entries per person per month. Photos need to be taken within the four weeks prior to submission. Photographs must be taken by you, and you must have the rights to the photo. Winners of prior months will not be eligible to win in future months within the same calendar year. Photos can be submitted once for the contest. Contestants must live in Santaquin or within a 10 mile radius of the Santaquin City limits. All images entered may be used in the promotion of “What Do You LOVE About Santaquin” photo contest. Submit photos in high resolution jpg format. Photo must be 4MB or smaller. Photos will be judged on originality, artistic composition, technical quality,relevance to the City and photographic technique. Winners may be asked to provide full resolution files of their images. There will be a winner selected each month and one overall contest Grand Prize winner for the year. Monthly Prizes: $50 gift card to a local business or $50 off your utility bill. Winner to choose. Winners will be announced and images displayed on the City Website, City Facebook Page, and the City Newsletter. Whether you’re a winner or not, it’s all about sharing your own ideas of what you love about Santaquin. General: By submitting your photo(s) to Santaquin City, you release all claims to individual copyright and certify you are the rightful owner of said picture. You authorize Santaquin City to use your picture on-line, in print, or in any other medium as determined by Santaquin City. For more details, please refer to the Official Rules. The Video Contest began in 2015, and is open to Payson High School students. This contest provides a scholarship to the winning student. Pictured below is Michael's family at the time they were presented with Michael's $500 scholarship. Michael was not in the picture due to him serving a LDS mission in Brazil at the time this photo was taken. Also pictured is Mr. Clint Perry from Payson High School (Far left). He is over the TV Broadcasting classes and works with the students in preparing the videos. Each month a worthy volunteer of our community is recognized at City Council meeting and on our social media pages, as well as our website. To learn more about our recipients of this award, click on the link in the gray section of this page.